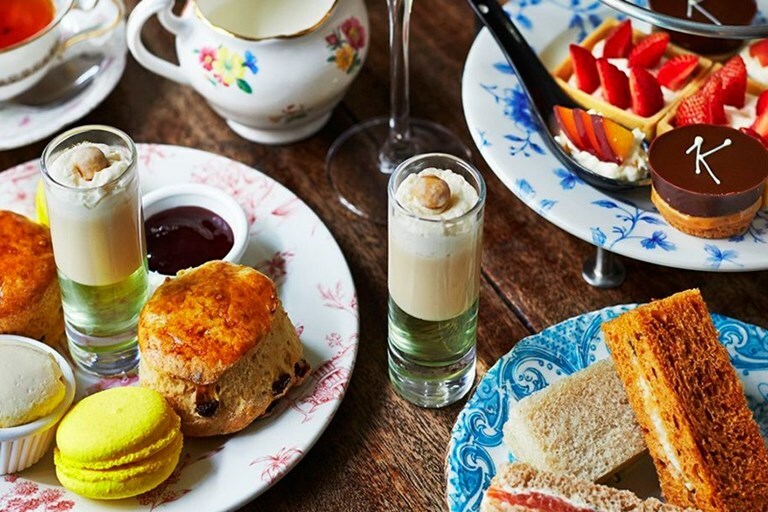 Is there anything more undeniably British than the Queen, rain in June or a traditional afternoon tea? The combination of all three was the making of a truly patriotic and delicious day. The Queen’s Diamond Jubilee saw us arriving at the riverside at 2.30pm – rather later then we had planned, and seemingly a good six hours after the majority of the crowds. However, thanks to the charms of Tall Dark and Handsome – of which I am all too aware – and his sequined Union Jack bow tie, we were granted access to a covered private area with front row views of the river pageant. The spectacle left us elated and full of national pride as we made our way, via Boris bike through the crowds, to historic Kettner’s. 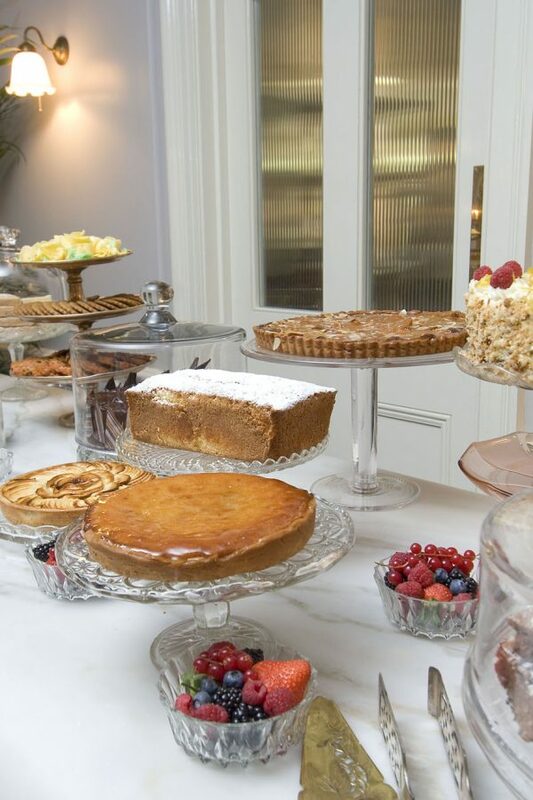 This Soho institution has launched a British Afternoon Tea ‘Fit For a Queen’ in their Pudding Bar and we were to sample it on the weekend of its Jubilee launch. Arriving as we did in a decidedly damp state, we were most grateful to deposit our dripping coats with the charming lady who welcomed us at the door and take a seat in the decadent surroundings. 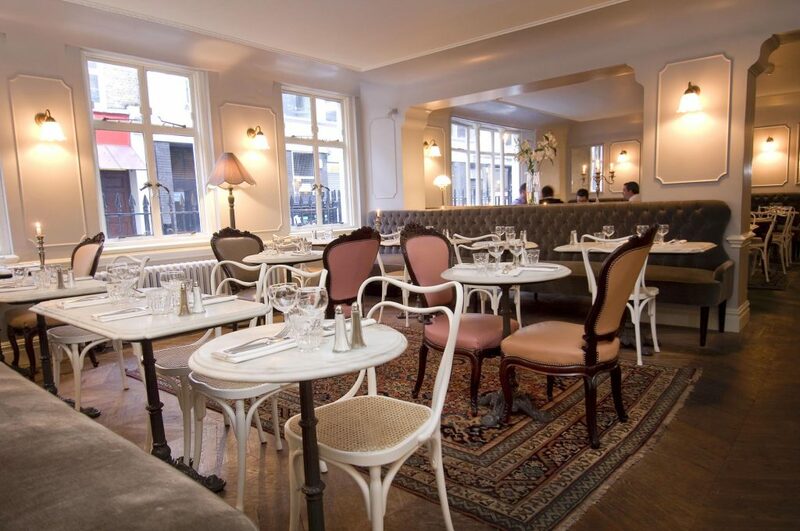 Originally a series of four Georgian town houses, Kettner’s was first opened by Auguste Kettner in 1867. 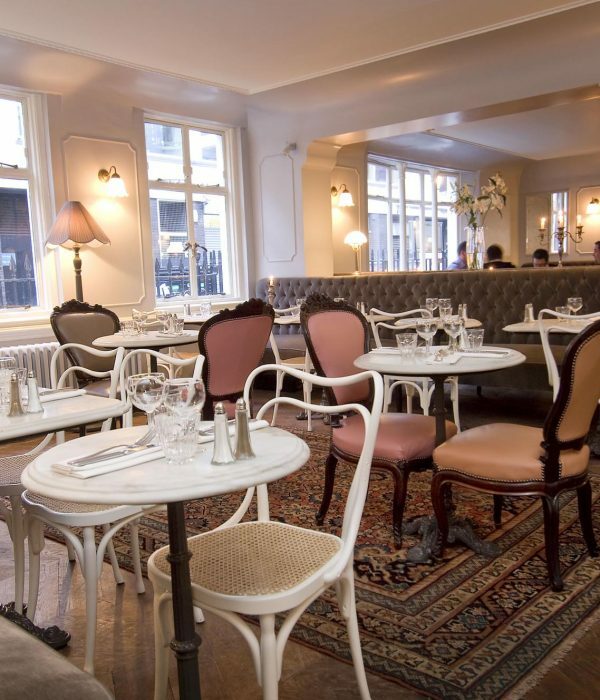 Their website reads that Kettner’s was “popular with deliciously colourful characters of the time including Oscar Wilde, Edward VII, Lillie Langtry, Agatha Christie and Bing Crosby.” They had better add TDH to the list. I wonder if the infamous parties held here ever saw a sequined Union Jack bow tie, let alone one adorning such a deliciously charming fellow?! We began our tea in style with a glass of Gobillard & Fils rosé champagne and, whilst sipping, perused the extensive tea selection. While the enchanting list includes Second Flush Muscatel Darjeeling, Iron Goddess of Mercy Oolong, and Lemon Verbena; I’d say that throughout the day my entire physical system is probably made up of at least 30% Earl Grey tea so I opted for this much loved favourite. TDH, liking to keep things ‘pure’, is a caffeine-free zone, so he acquired a delicate glass pot of Wild Rooibos. Milk arrived in a small glass bottle apparently reminiscent of the days when milk was given to children at break time in schools. I was relieved to discover I was too young to have experienced this phenomenon, but nodded sympathetically as TDH and our friendly and interested waiter spoke in raptured tones about its unrefrigerated past horror. No matter; the bottle was cute and that’ll do me! Surveying the menu, my eyes passed over the Afternoon Tea Cocktails and I made a mental note to return to them. We opted for the full ‘Fit for a Queen’ experience and before long a beautiful stand was placed between us on the marble table, laden with delicate finger sandwiches – smoked salmon and cream cheese, ham and mustard, egg and cress and the divine cucumber – homemade scones and selection of tarts and sweet treats. 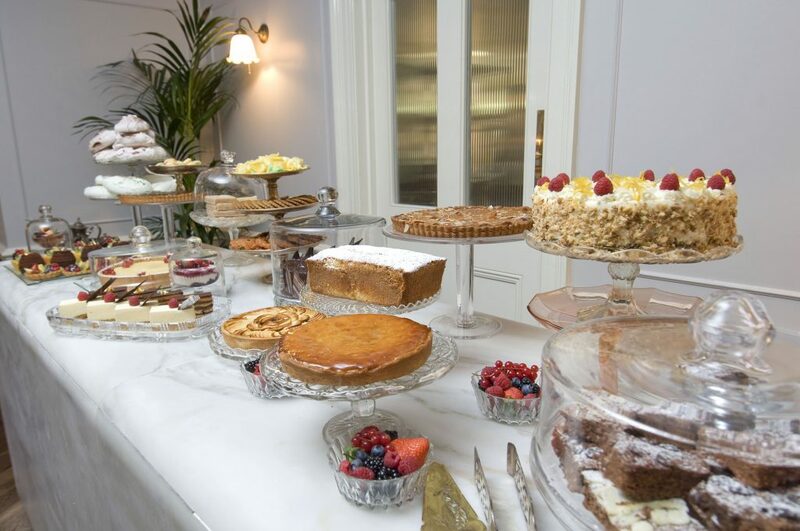 These treats were wonderful, delicate bite size treacle tarts, Chelsea buns, Old English trifle and other delights. Worthy of special mention is the Chocolate Digestive Cake, like heaven in the shape of a bourbon biscuit. TDH was dubious about trying the Rhubarb Jelly with pomegranate foam. Apparently he has “never really got on with jelly”. However, the foam had a delicate orange flavour and the jelly was more like a rhubarb puree, and while TDH managed gamely to gulp it down in the name of research, I could have eaten six of them and asked for more! The scones, of a hearty consistency, were served with the indispensable clotted cream and the jam of choice for anyone with taste and discernment: raspberry. After a several teapot refills it seemed an appropriate time to order a G&Tea and an Earl Grey Martini. Jasmine tea infused Plymouth Gin with apple juice, elderflower cordial and fresh cucumber for TDH and Earl Grey Syrup and Cointeau shaken with apple juice and served with a twist of orange and lemon for yours truly. We were gently led through to the bar to a private sofa area to enjoy these decadent drinks in undisturbed comfort. We toasted her majesty and a wonderful day. God Save the Queen!